Worldspan Group has reported a 14% drop in turnover for the year ending 30 June 2009 - but remains confident of improvement in the new year. The group's consolidated profit-and-loss account shows that turnover fell from £5.4m in 2008 to £4.6m in 2009, while pre-tax profits declined from £233,345 to £143,528. Worldspan Group's events and conference division suffered a dip in activity as clients cancelled or delayed projects during the downturn, according to the latest financial statement submitted to Companies House. Worldspan Events director Sophie Morris said: "After three years of extremely strong growth and, without doubt, one of the most challenging years we have experienced in nearly four decades of business, we have truly held our own and can see signs of activity increasing next year." In recent months, Worldspan Events maintained its place on BT's agency roster and won a three-year place on the event management roster of Allergan, which has been a client since 2006. Meanwhile, Worldspan Motivation saw a 102% increase in turnover and a 77% increase in profits as it expanded its range of services and won new clients in the public sector. 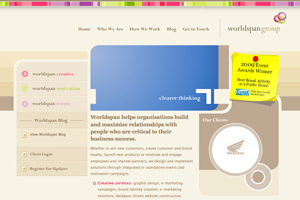 Founded in 1972, clients of Worldspan Group include Honda, Ricoh, BT Global Services, Microsoft and Monster Worldwide.